The Fletcher Trust is an independent registered charitable trust with a strong historical connection to the development of New Zealand. The Trust informs and supports New Zealanders to continue the best traditions of educational, social, cultural, and business innovation. 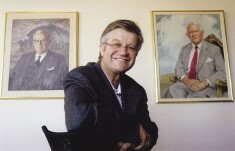 Angus Fletcher joined the trust as deputy chairman in 1998 and became executive chairman in 2007. In addition to his work for the Fletcher Trust, Angus is trustee for a number of charities and has been appointed to a number of advisory boards and councils. The Fletcher Trust Archive is a unique social and commercial history of New Zealand from the mid-nineteenth century to the present day and comprises records and information on an extensive number of businesses and enterprises across all sectors. The Trust’s purpose with its Archive is to maintain all the records and continue to provide public access. The Fletcher Trust Collection’s paintings come from the whole sweep of New Zealand’s art history. The Trust’s purchasing policy supports the work of both emerging and well-established New Zealand artists. The Fletcher House at Broad Bay was the first building built by James Fletcher after he went into business in Dunedin in 1909. The house, which is open to the public, was restored by the Trust and is preserved in commemoration of James Fletcher. The Trust’s philanthropic focus is education and youth development. The trust supports programmes that enrich the lives of young New Zealanders and their communities. Nine clubs for Fletcher Challenge retirees throughout New Zealand are supported by the Trust.